The BBC’s iconic Television Centre closed its doors on March 31 after 53 years of service which endeared it to viewers and celebrities alike. The 1960s building in west London was sold for £200m and will be redeveloped into a hotel, flats, a cinema and office space. To mark the occasion the BBC staged a series of televised events and programming including a live concert by Madness outside the building (broadcast on BBC Four), a special ‘outdoor’ One Show on BBC One which linked live to the concert and a two hour documentary about the building where a host of stars shared their TV Centre memories. ELP provided lighting for both outside broadcast events. The company already supplies lighting director Dave Evans for the daily (studio based) One Show broadcasts. For this outdoor special Dave specified a completely new rig which included: Arri Junior 650W Fresnels, ETC Source 4 profiles, Clay Paky Alpha Beam 300s, Martin MAC 301 LED Washes, Thomas Pixel Pars and PixelLines, Chromaflood 200TCs and Chromastrip 900s. These were hung from an open sided structure built by the ELP crew (including Saul Harris and Chris Rand) from their own Quadralite truss. "I opted for Clay Paky Alpha Beam 300s to provide sharp beams of light to enclose the outdoor studio space. 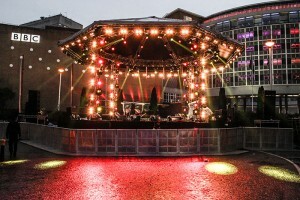 I considered Clay Paky Sharpys initially but opted for the slightly thicker beam of the 300s," comments LD Dave Evans. He continues: "Chromastrips provided decoration for the truss structure, while Martin 301s and Thomas Pixel Lines created a solid bank of light accented in the recognisable BBC News 24 red." The weather on the night was wet and very cold but one positive effect was that LD Dave Evans placed clear plastic sleeves over the moving Martin 301 LED wash lights. This had the effect of providing a more diffused wavey lighting effect which complemented the overall design. 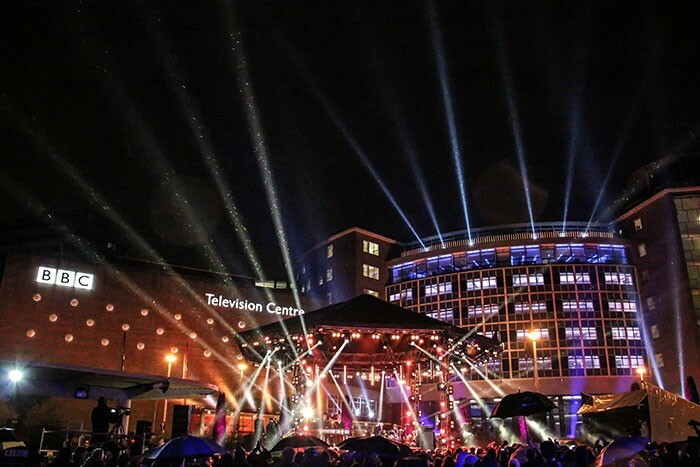 The backdrop to Dave Evans’ One Show design was the BBC TV Centre building which was lit by LD Dave Gibson as part of the Madness concert event. Evans requested that Gibson give him a red and mauve backdrop to complement the One Show look. Both Dave’s worked in close collaboration. The closing moments of the One Show saw Madness take to the stage with their hit single One Step Beyond. The rest of the hour long live concert was then transmitted live on BBC Four. Lighting director Dave Gibson was responsible for the Madness stage and the lighting of the TV centre building. ELP provided him with the on-stage lights plus their 200kW Twinset power generator. ELP also built the bandstand stage structure. Richard Martin Lighting provided an assortment of fixtures to light the building both from the inside and outdoors. 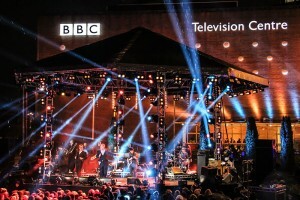 ELP’s bandstand structure, which has previously been used for Songs of Praise and Eisteddfod events, was ideal for this setting because all sides are completely open and TV viewers plus on-site audience could see the iconic TV centre building as a backdrop. ELP gaffer Darren Fletcher commented: "The stage usually measures 12m x 12m but the great thing about the structure is that it’s flexible so we are able to tailor it exactly to fit the space available." In this case Darren and his ELP Manchester crew tailored the structure to 12m x 9m so that it fitted exactly before setting about installing the lighting which included 72 PAR 36 2-Lights, 32 Sharpys, VL3500s, Robe Robin 100s and Sunstrips. "This is the biggest rig we’ve ever had on our bandstand stage. Dave Gibson holds the record at the moment with 180 lights in total, but if there are any LD’s up for the challenge of beating Dave, then please give me a call," remarked Darren teasingly. Dave Gibson’s lighting design was guided by three important factors. Firstly, he wanted to ensure that the view of the building behind the bandstand was not interrupted by lighting fixtures. Secondly, he needed to get as much kit onto the structure as possible to give it the wow factor. And thirdly, the inevitable ‘budget considerations’ played their part. The LD’s solution was to cram the bandstand with Sharpys and Tungsten 2 Lights. Both are small and compact. "The Sharpys pack an enormous punch for a small unit and the PAR 36 Two Lights are a neat and tidy way of creating an audience blinder. I really like their tungsten look in contrast with the piercing beams of the Sharpys," enthused Dave. Dave positioned the PAR 36 2 Lights in landscape across the top of the bandstand and in portrait on the vertical parts of the bandstand structure. This neat configuration meant that the view of the TV Centre building behind was virtually unrestricted. Also the Two Lights are a relatively inexpensive fixture which helped with the overall budget. Dave used Robin 100s and Sunstrips to further decorate the truss structure around the mid sections and to provide further colour accents. The fact that many of the TV centre offices were now empty provided Dave with the unique opportunity of being able to install Chromafloods within the building to provide a colour wash across TVC windows. This combined with over 100 Chromastrips plus 12 Sharpys on the roof top to create an impressive effect across the iconic building. Dave Gibson’s two board operators were Rob Bradley who looked after generics and Alex Mildenhall on moving lights. Under Dave’s direction they prepared different looks for each of the 16 songs delivered by Madness. The challenge was that rehearsals took place in daylight while the broadcast was at night, so there was some educated guess work involved by the team and continuous re-balancing as darkness unfolded over west London. Dave remarked on how this landmark job was "a brilliant collaboration between the BBC electricians who rigged the building, RML who provided lighting inside TV centre and ELP who provided power, structures and stage lighting." But the last reflective word on this project came from ELP’s overall project manager Barry Denison. "It was great to be the company brought in for the grand finale concert. ELP began supplying TV Centre in 1983 when PAR cans were the new 'flavour of the month' on TOTP and we continued that relationship pretty much until the show came to an end. 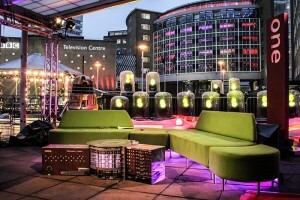 So we supplied TV Centre for about thirty of it's fifty-three year life span, which everyone at ELP is very proud of."